This post is an extension to my recent post on my ideal cash flow. My previous post focused on the optimum cash flow that allows people to live without worrying about their financial situation. It is indeed a desired situation to be in for everyone (hmm, at least for me). Today, I am going to study the time it takes for us to achieve the ideal cash flow. In other words, how long does it take to have the ideal cash flow so that you can declare to yourself that you are officially financial independence? For a saving rate of % and an investment return rate of %, the number of working years to achieve financial freedom is years. Yes, you can retire after 5 working years if you had 75% saving rate with a moderate 6% rate of return on investment. 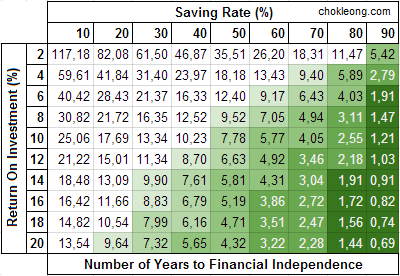 In case you have questions about saving rate, you can read this post. What you can notice is that, with a lower saving rate like 30% (assuming 6% return rate), you would need to work for 20 years before you can afford retire. You would need to work even longer (more than 40 years!!) if you save less for example <10%. You can try this yourself by adjusting the percentage rates by dragging them. There is an assumption made in the calculation. It assumes that you spend the same amount of money each year. 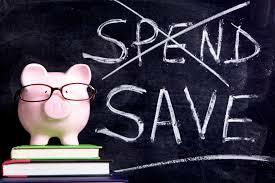 If you could maintain your expense low throughout your lifetime, then the calculation would make sense to you. The key is to have high saving rate in order to achieve financial freedom quickly. How to interpret the result? Here is the summary of different scenarios (see picture below). With different saving rate and return on investment, your remaining working years to achieve financial independence are different. Let’s say Bob has a saving rate of 70% per year, which means after taking into account all his expenses including house loan, food, entertainment, children education, etc he can still save 70% of his income, and he has a portfolio that return 10% per year, then he can safely retire after working for another 4.05 years. He can achieve financial independence in 4.05 years. However, this table only serves as a guide not a rule. 5 working years to financial independence? I think this post will be controversial and not many can accept this “uncommon” answer. But I encourage people to have possibility thinking. Try focusing on how things can be done but not just finding reasons that the things might fail. Use possibility thinking: once you achieved financial independence, you could still continue working if you wish. No law on earth forbids people to continue working once they achieved financial freedom. In fact, each additional year of working could contribute to their nest egg another layer of cushion. They have higher “margin of safety” in case anything bad happened to their financial situation. Isn’t that wonderful? Imagine you have accumulated a large amount of fortune to be passed down to your kids in the future, how does it feel? If you are curious about how the figures are generated, you can continue with this section. Note: For those who have math phobia, you can safely skip this section. This formula is important to determine how long the portfolio will last. We want to know how large is the . This equation is the key formula for early retirement. If we have , then the denominator is 0 and . This means that the portfolio will last forever. The principal will be preserved forever because the portfolio grows exactly by the amount that is withdrawn. where is the saving rate and is the number of years worked. This formula simply means, for a saving rate of 0.1 or 10%, it takes (90/10=) 9 years of working to save enough money to spend on needs and wants for one year of not working. If you are interested to know more about the formulas used above and their derivation, you can read from this book Early Retirement Extreme: A Philosophical and Practical Guide to Financial Independence at this chapter “Financial independence and investing”. This entry was posted in Investment, Number and tagged Finance on May 12, 2014 by Chok Leong.